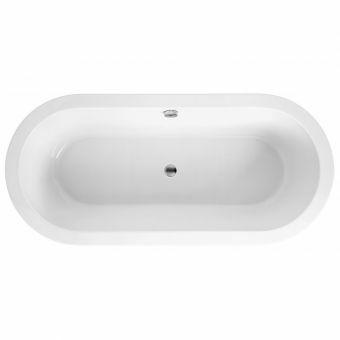 VitrA T4 BathFrom £959.21 inc.VATRRP: £1199.00 (Save 20%)German designed modern deluxe bath, large in size at 1800 x 800mm, reinforced acrylic. Free DeliveryKaldewei Cayono Duo Steel BathFrom £670.32 inc.VATRRP: £957.60 (Save 30%)Antislip options available with order. The very finest baths in our collection, these luxury tubs are guaranteed to bring a touch of splendour to the bathrooms where they are placed. They are the kind of furnishings that dominate their surroundings, though they can be matched with large windows, mirrors or luxury rugs to even more dramatic effect. Some people like them so much that they take them out of the bathroom altogether and keep them in bedrooms - the perfect place for a lie in. These baths are all about indulgence. 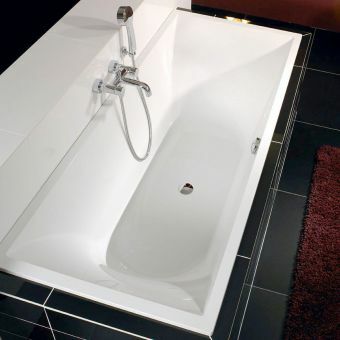 Several, like the Imperial Beglioni Cobra cast iron bath and the Victoria and Albert Amalfi modern slipper bath, are deep enough for the body to be almost completely covered even in a sitting position, while others, like the Clearwater small teardrop freestanding bath, are ideal for lying back in, with soft curves against which to rest one’s head. These are not baths to dip in and out of, but baths in which to spend a long time soaking with bubble bath, candles and your favourite music. 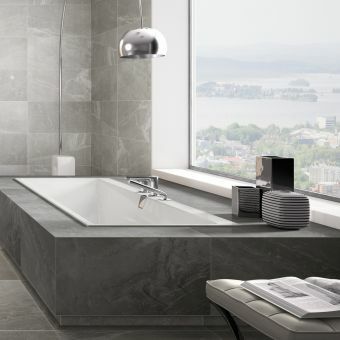 A bath like this can turn an ordinary modern bathroom into something special. In an older house, it can enhance the beauty of traditional features. 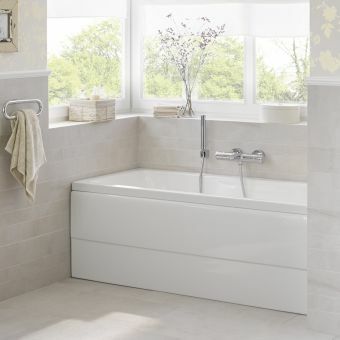 The Imperial Radisson Cureo cast iron and real leather bath or the Clearwater Classico natural stone traditional bath is the ideal choice for the Victorian or Georgian home. 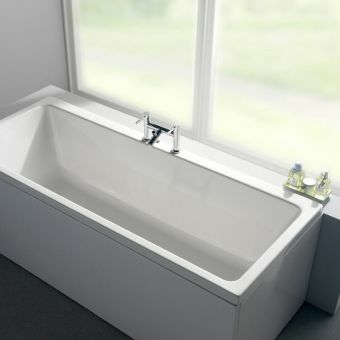 The stylish ClearGreen Freestart double ended freestanding acrylic bath, meanwhile, benefits from chic modern styling that will look good just about anywhere. Our double ended baths represent the very highest in luxury – guaranteed to bring a touch of wow to your bathroom. The very last word in indulgence, double ended baths are designed to make a statement and when coupled with large mirrors, big windows and luxury rugs, their effect is doubled. These are baths to spend hours soaking in, either placed in a bathroom or for stunning effect in a bedroom, they add a touch of class. We have an extensive range, stocked with you in mind. 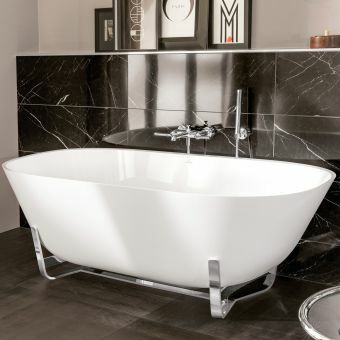 Whether you’re looking for a cast iron bath from the Beglioni collection, deep enough to cover you even if you’re sitting, or a freestanding bath like the Clearwater Teardrop, designed with perfect curves, you can be assured we’ve got just the bath for you. Sit back, relax and browse through our range, dreaming of the ultimate in comfort, luxury and design. 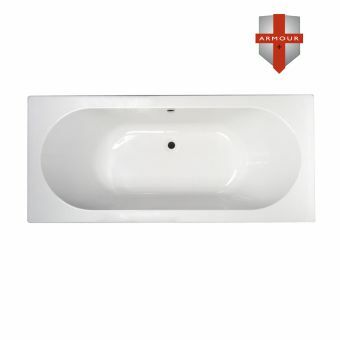 The Carron Quantum double ended bath is an elegant yet simple bath with central tap holes, for the ultimate in comfort and luxury. 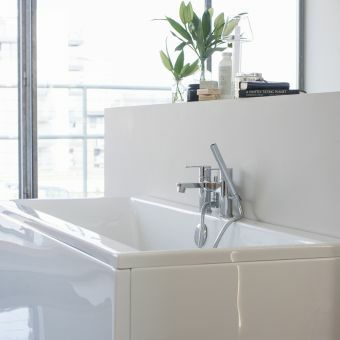 Its clean, plain lines make it equally at home in the contemporary or traditional bathroom setting. 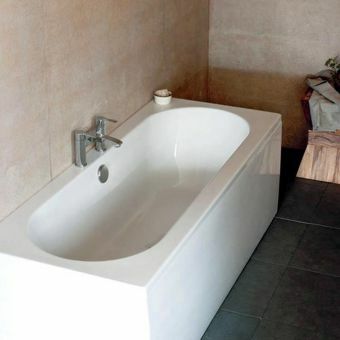 Double ended with two sloping sides, it’s larger than a standard bath, giving you the perfectly sized bathing area to completely relax in. Available in a white 5mm acrylic finish or Carron’s unique patented Carronite finish, the Quantum comes with Carron’s 30 year guarantee as standard, offering outstanding value for money. 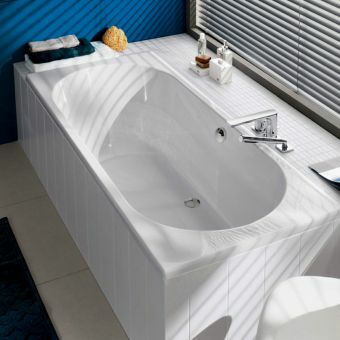 A Carronite finish ensures your bath stays hotter than average baths, again giving you the very best in comfort. Designed for a lifetime of use, this bath is sure not to disappoint. Available in a choice of four sizes, please be sure to add matching bath panels at checkout. 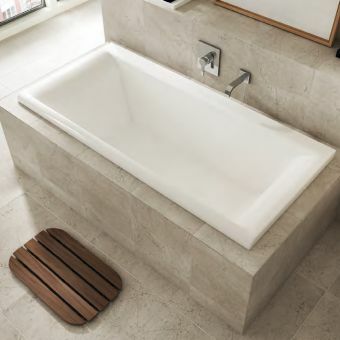 Ideal Standard are a leading manufacturer of outstanding hygiene ware, and they bring all their design expertise to the table with the Moments Rectangular bath, an innovative, design led bath that’s sure to create a stunning feature in any bathroom. 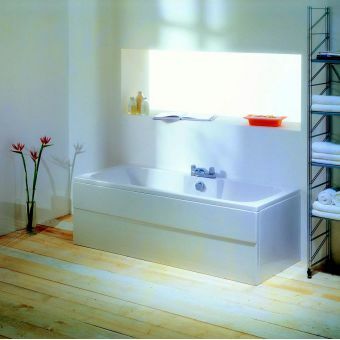 With an illuminated front panel when the bath backs the wall, the Moment is a bath that’s sure to create an impact and provide the perfect ambience for a long, relaxing soak. Chose from illuminated end panels to continue the impact, or add wooden end panels - providing the perfect contrast - and carefully concealed storage areas. The Moment is not only beautiful, it’s practical too. With no tap holes, the Moment is designed to be used with wall mounted taps; we have a large range of taps available in our brassware section. 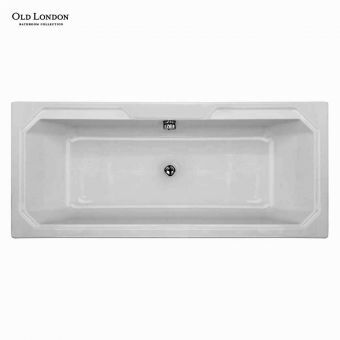 Finished in acrylic, this bath is sure to add the finishing touches to your bathroom. 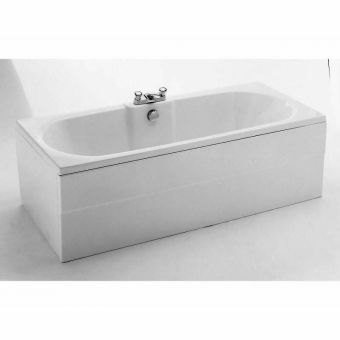 The Adamsez Essence Pure I double ended bath is designed to create a feature of the bathing area. 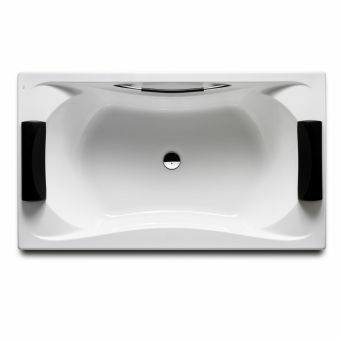 The Essence Pure I is an inset bath, meaning it’s to be used inset into a plinth, as oppose to a freestanding bath. 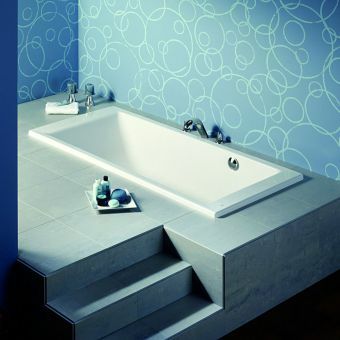 This allows it to become a real feature of a modern bathroom. 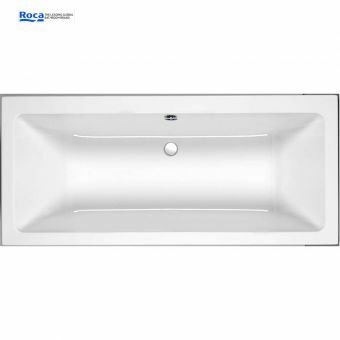 It’s designed to be used with a variety of plinths and can be used with plinth or freestanding taps. 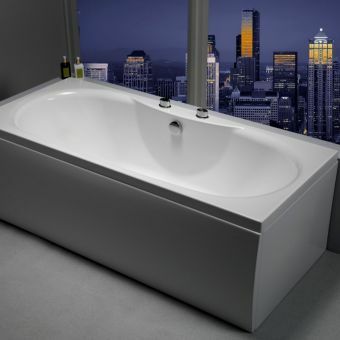 This is a beautiful, smooth bath with elegant curves. 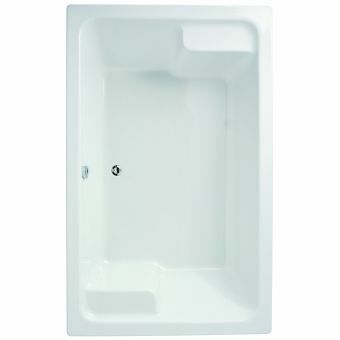 It's deep, with excellent shoulder room, and with 200 litre water capacity, it’s a bath worth sharing. Finished in a high gloss, it comes with a lifetime guarantee, meaning your money is well spent. With two gently sloped ends and perfect curves, the Signa Grande bath has been designed by expert craftsmen with dual bathing in mind. 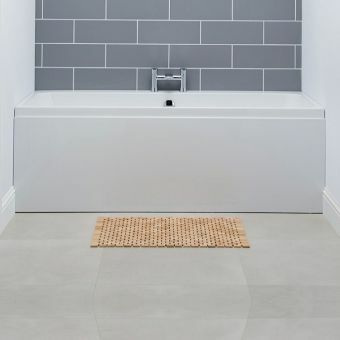 It’s one of the most spacious baths in the Adamsez range, with a 398 litre capacity, and when set within a choice of plinths, it’s the perfect fit for the contemporary or traditional bathroom. 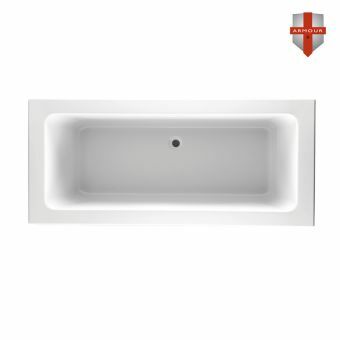 Available in classic white, allowing the design of the bath to speak for itself, and coming with a lifetime guarantee, the Signa Grande will give your bathroom the ultimate facelift and you many, many happy years of bathing. 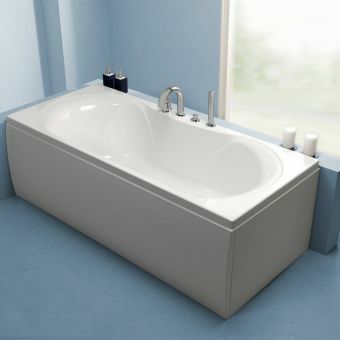 Use with mounted or freestanding taps to create a bespoke bathing area. 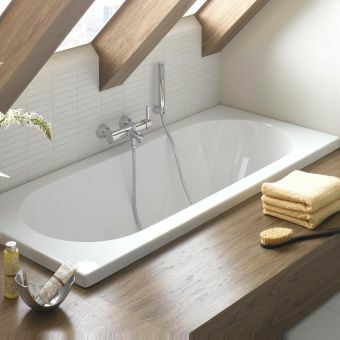 Villeroy & Boch are renowned leaders in the luxury bathroom field, with a reputation for quality and innovation and the Villeroy & Boch Squaro Edge 12 Luxury Bath does nothing to diminish their reputation. Clean and elegant with simple, smooth lines, the Squaro is available in both freestanding and mounted options, and a choice of three lengths, making it the perfect, versatile choice for the modern bathroom. With a rim of only 12mm, it has a slimline profile, maximising bathing capacity, and allowing it to integrate into any bathroom space. 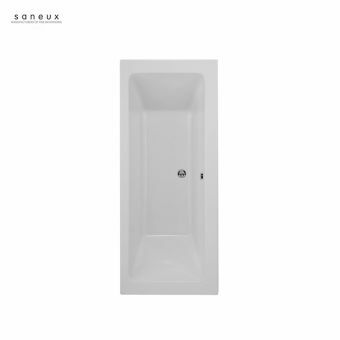 Built from durable, robust materials, the Squaro is a bath designed for many years of use, and features safety as standard, with a special non-slip film. Adjustable bath feet are supplied as standard and the bath is suitable for use with a wide range of deck, wall or floor mounted taps. 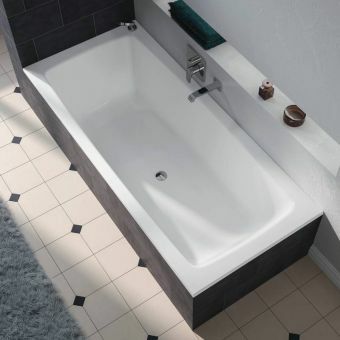 The Carron Alpha is a steep sided, curving double ended bath, designed with comfort and relaxation in mind. The ultimate bath to lie back and forget the day in, the Alpha can be finished in famous patented Carronite technology, guaranteeing a bath that stays hotter longer than average, adding to your bathing comfort. Not only does Carronite heat the water for longer, it also creates a bath that’s twice as strong, which is why all Carronite finished baths come with a 30 year guarantee. Although the Carron Alpha comes without tap holes, these can be drilled to your requirements, allowing you to chose taps that merge seamlessly with you intended bathroom design. 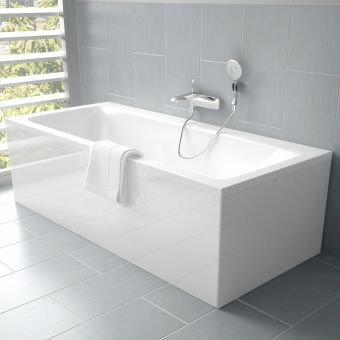 The Carron Alpha is a versatile bath, suited to both the modern and contemporary bathroom space. Please note that brassware, waste and overflow must be purchased separately. The Carron Celsius is an elegant double ended bath with gently sloping sides, the perfect antidote to a long day. Carron’s unique patented Carronite technology, available as a finish for the Celsius, guarantees the bath will stay warmer for longer, providing you with the optimum in bathing comfort, along with a 30 year guarantee – keeping you and your wallet satisfied. 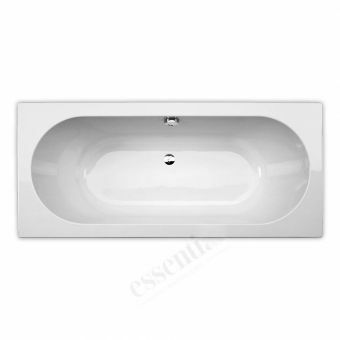 Double ended with a central overflow, the Celsius has a 300 litre capacity, meaning you can relax in comfort. With an optional l-shaped side panel, creating sleek, smooth lines, the Celsius brings all of Carron’s 250 years of design heritage into your bathroom, allowing you to create the perfect bathing space. The Celsius comes with the optional extra of concealed overflow, creating a clean, flawless finish for the minimal bathroom. Brassware and waste are not included in the price. Please see our extensive range of brassware for the possible combination of taps. 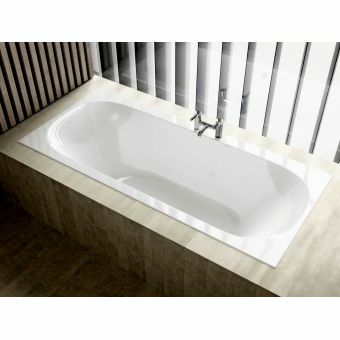 The Carron Equation’s softly curved shape creates the perfect bath to lie back in after a long, hard day. Not only that, but it presents a beautiful option for either the modern or traditional bathroom, with its understated elegance it won’t dominate your room. Designed to support your body, its cradle feature offers you the very best in comfort. Carron’s special patented Carronite finish keeps water warm for far longer than the average bath finish. 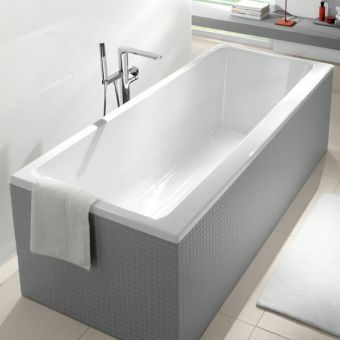 It also protects the surface of the bath, creating a bath that’s both stylish and durable - it's designed to last for up to 30 years. With two tap holes the decking space has room for a range of elegant brassware options, please see our range for ideas as to how to perfectly complete your ideal bathing space. 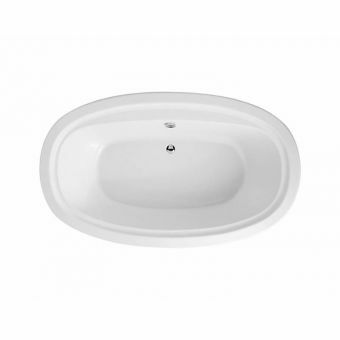 The Carron Halycon inset bath is a gorgeous smoothly curved bath, offering you the ultimate in comfort, style and durability. With a water capacity of 250 litres, it’s the perfect place to soak for hours after a long day. Carron’s patented Carronite technology makes the Halycon even more appealing when you learn it radiates heat perfectly, allowing the water to stay warm for far long than in the average bath. Not just that, Carronite makes for a more durable bath finish, so much so that all Carronite finish baths are guaranteed for 30 years. 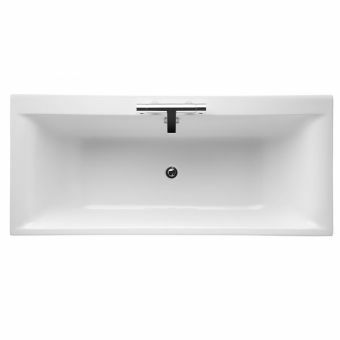 Simple and elegant, the Halycon is designed to be inset into a plinth, creating a stunning centrepiece for a contemporary bathroom. 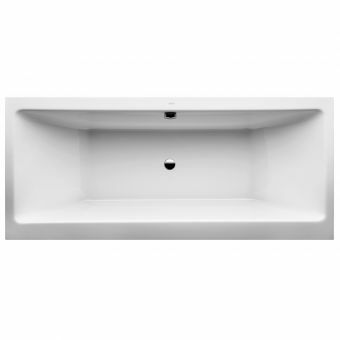 Available for use with a range of plinths depending on your requirements, you can customise your space further by using select brassware, be it wall mounted or freestanding taps. 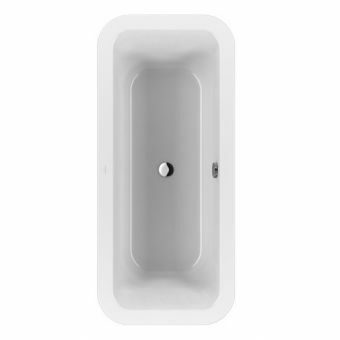 Available in either an acrylic finish or Carronite, with a 20 or 30 year guarantee respectively, the Halycon is a bath sure to give you many years of comfort and value.